With less than three weeks until our big day, I'm doing my best to remain calm and collected. Though there was a moment this week when I was doing my third cardio workout in as many days while whitening my teeth, and I suddenly thought, "So this is what it means to be a bride..."
Our best buddy's birthday was Friday, along with my Mama's, and after a very full but rewarding week at work, I dashed over to Cask to pick up an appropriate gift before heading to their apartment. John was already there, and we got to meet one of our best pal's best pals from back home over wine and cheese. After polishing off a few bottles, we strolled just down the street to Lers Ros for spicy Thai food and ice cold beers before settling in at one of Amsterdam's sidewalk tables for a few more drinks. Around midnight I basically scooped John up and took him home; his eyes were starting to close, and I realized we're only 20-somethings in age these days. I was up early the next morning, but in no rush to leap out of bed to start making breakfast. I let John quietly nurse his hangover before we headed to our favorite grocery store with a thorough shopping list. We grabbed everything we needed for Saturday morning pancakes (along with the rest of the week) and strolled over to Hollow for his & hers caffeinated drinks before headed home to cook up some old-fashioned flapjacks. I'd insisted on a bottle of Grade B maple syrup, and drizzled over over pancakes with strawberries and bananas, we were in total breakfast heaven. After putting the house away and opening up all the windows wide, we both got down to work. I dashed out for a bit to check out an open house for a work event I'm planning, and before we knew it, it was time to put on our best for the ballet. I'd scored lovely seats for San Francisco Ballet's Shostakovich Trilogy choreographed by Alexei Ratmansky, and at dinner at Papito with the ballet librarian before the show, we got the dish on the performance. It was an absolutely fabulous evening of dance, we ran into friends not once but twice during the intermissions, and best of all, we were home before 11! We were up early the next morning and while John roasted potatoes and poached eggs for my favorite weekend breakfast, I checked email and a few other things off my list. After breakfast, we got into our usual routine – practice for John and a run in the afternoon, reading and writing for me with a midday break for some Ballet Beautiful. We braised chickpeas in a rosemary-tomato sauce, and covered them with a bit of burrata for supper, which we ate up on the roof with the last of a bottle of rosé. And if we hadn't had enough ballet already, that evening we cozied up with the Royal Ballet's production of Firebird and Les Noces for our second dose of Soviet composers. It may not have been everyone's perfect weekend, but it was certainly ours! But tell me, what were you up to this weekend? Grabbing brunch at a new restaurant with your best pals, tackling a big DIY project or seeing a fabulous show, perhaps? 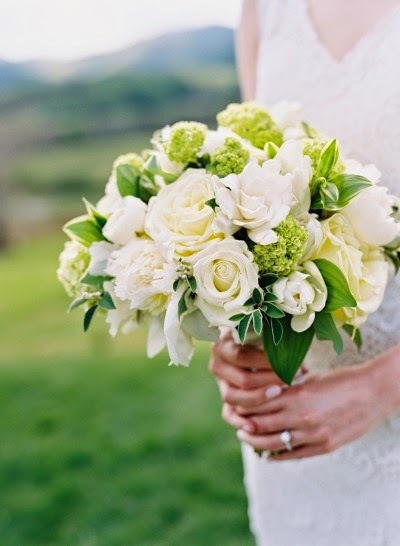 Image by Elisa Bricker, green and white bouquet by Beehive Events. You are a busy bee Miss Bride...but your weekend recaps always make me hungry in the best of ways! Wow, I can't believe you're just a few weeks away from the big day - how exciting! !